Use two Ethernet ports: one for to serve external requests, one for local access. 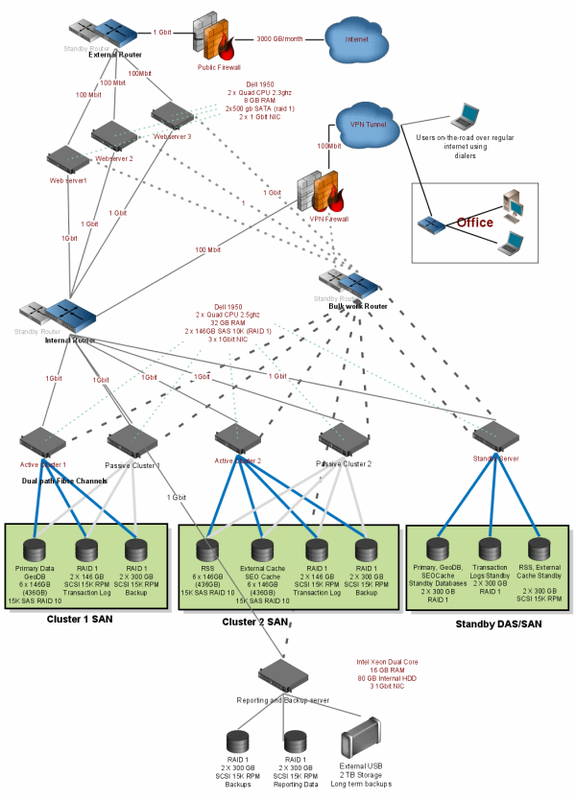 "Keep your load balancer dead simple – use basic round robin". Each router and firewall has a standby one. Get moderately powerful Web servers with enough storage. Run 64bit version of Windows. The whole internal network is fully 1Gbit (network cables, routers/switches, NICs etc). Only use VPN to access your server. Database servers must be the most powerful (RAID 10 Disks, Memory, CPU). Store Database files on a separate physical disk. Always perform backup and log shipping to different physical disks, preferably on RAID 1. Use Windows Clustering for high availability with Storage Area Network. RAM, lots of RAM for Database servers (2 GB + 60% of MDF size). Get Dual Path Fiber Channel connection to SAN from your servers. Have a separate server for moving IIS logs from webserver. Have a large detachable external storage like External USB drives. Use fast SCSI RAID 1 disks. Use separate NIC on all servers that is connected to a separate private network via separate switch for bulk operations. Please keep in mind these suggestions are for really heavy duty web applications.